For many collectors, old Kenmore sewing machines represent an important part of America's sewing history. Since the 1930s, seamstresses have relied on these machines to complete their everyday sewing tasks. Today there are hundreds of vintage Kenmore sewing machines available for collectors and enthusiasts. You can find vintage Kenmore machines locally at flea markets, garage and estate sales, thrift stores, and second-hand shops. The oldest models, some dating back to the 1930s, also appear in antique shops. EBay - The auction giant has a continually changing selection of vintage sewing machines, including Kenmore models. If you don't find what you want right away, keep checking back for newly listed items. Craigslist - In many areas classified site Craigslist has become the go-to resource for finding used items. Search in the antiques section and arts and crafts section for vintage Kenmore sewing machines. Etsy - The vintage section of this popular artist marketplace is a great place to score an old Kenmore machine. Since many of the customers are crafters and seamstresses, this site has lots of vintage sewing machines of all brands. The inventory is constantly changing. Although Sears, Roebuck, & Company sold treadle sewing machines as early as the 1890s, they did not begin selling Kenmore-branded machines until 1933. The Kenmore machines ran on electricity rather than using the foot treadle. According to the International Sewing Machine Collectors Society, most of these early Kenmore machines were actually manufactured by the White Sewing Machine Factory. In the 1950s, Sears began manufacturing the Kenmore machines overseas. Over the years, a few Kenmore machines stood out for their popularity with consumers. The first Sears machine to carry the Kenmore brand, simply called the "Kenmore," was a very utilitarian model manufactured by White. It could sew forwards and backwards and featured an integrated sewing lamp. It had a simple textured surface and no decoration. It can be difficult to find an original Kenmore for sale, since there were fewer of these machines made than subsequent models. Pricing depends on the machine's condition, but an example in working order could be worth between $200 and $500. This model, which came with an integrated cabinet, had a similar utilitarian look to the original Kenmore. The basic black painted finish and lack of decoration underlined the idea that this model was for use, rather than decoration. It featured a buttonholer which made it easier for the average seamstress to create shirts and coats at home. You can find the Model 117 Kenmore on eBay and in antique shops. 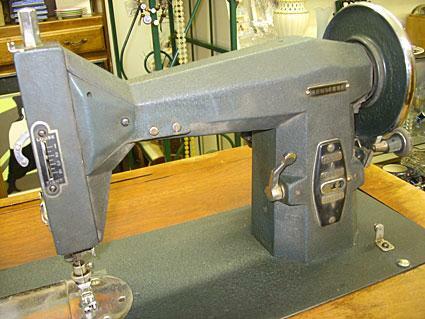 Many of these older machines still function perfectly and can handle your basic sewing needs. According to eBay sales history, expect to pay between $150 and $300 for a Model 117 Kenmore sewing machine in good working condition. At the time it was released in the 1950s, the Kenmore Model 84 featured some of the latest developments in sewing machine technology. Also manufactured by White, this machine could perform a zig-zag stitch. This new stitch allowed seamstresses to sew seams that could stretch. This model appears at thrift stores and auction sites somewhat frequently. You can find a Kenmore Model 84 in good shape for between $100 and $300. According to the International Sewing Machine Collectors Society, one of the most popular Kenmore machines ever made was the Model 71. The fact that it was lightweight was likely responsible for some of its popularity. Constructed of aluminum and featuring a fully portable design, the Model 71 weighed in at just over 17 pounds. In an era when sewing machines could weigh 30 pounds or more, this made it a practical option for seamstresses who did not have a dedicated sewing place. You can find Kenmore Model 71 sewing machines at second-hand shops for about $50 to $200, depending on the condition. For a select group of collectors, Kenmore sewing machines will always hold a certain charm. Most of these machines were simple. They didn't feature elaborate moldings or floral decals like many of their contemporaries. Instead, they simply acted as the sewing workhorses for busy American families. Owning one of these machines is owning a part of America's sewing history.